Liu, the joint UT-Oak Ridge National Laboratory (ORNL) Governor’s Chair for Power Electronics, serves as deputy director of CURENT, the Center for Ultra-Wide-Area-Resilient Electric Energy Transmission Networks. 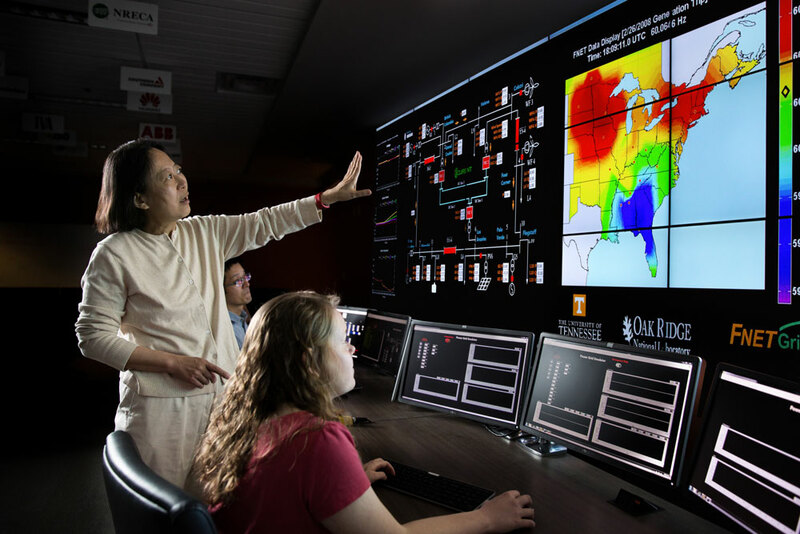 Housed in the Tickle College of Engineering, CURENT is a $38 million, National Science Foundation-funded center devoted to making the nation’s power grid more secure, reliable, and efficient. When many people think of a widespread power failure, they imagine a massive storm. In reality, the threat to our modern, interconnected power system can come from just about anywhere. Power-related engineering has to take into account problems from weather, overuse, animals, and human action—accidental or otherwise. Liu has played a critical role in developing technology that helps the center achieve those goals. Perhaps no breakthroughs have been more important than a pair of ideas known as FNET/GridEye. FNET/GridEye event playback of the loss of a power plant in Florida. Along with other researchers at ORNL and UT, Liu developed the FNET/GridEye system to help monitor the power grid in real time. It detects power grid “events” and their locations through GPS time synchronization technology, taking measurements at more than 1,400 times per second. Those computations enable power operators to make split-second decisions about failures, increased loads, and other problems. FNET/GridEye is user friendly and cost effective, while also capable of high-speed readings and calculations. Liu has been involved with a number of other patented ideas that have helped shape CURENT into a cutting-edge laboratory. A look inside the power grid operation visualization room in the Min H. Kao Electrical Engineering and Computer Science Building bears out the level of innovation she and her CURENT team have undertaken. The main room features a cinema-size screen with a computerized look at a power grid, complete with control stations. The setup allows faculty and students to run simulated problems on the grid, developing responses to problems before they occur in the real world. In recognition of her accomplishments, Liu was inducted as a 2016 fellow of the National Academy of Inventors. The academy cited her “spirit of innovation” and the impact her efforts have made on everyday life.